February 12th is an annual international celebration of the life and work of Charles Darwin, collectively termed “Darwin Day”. These global events have similar objectives: to educate and excite the public about evolutionary science. Although Darwin’s work is most often discussed in terms of its incredible impact on evolutionary biology, his explanation of evolution by natural selection has strong implications across an array of scientific fields, including geology and paleontology. Darwin Day at the University of Tennessee, Knoxville (UT) is one of the longest running annual celebrations of Charles Darwin’s scientific advances; 2016 was the 19th year this event has been running in eastern Tennessee. All of the events are free and open, both to the UT community and the public. Darwin Day UT is primarily organized by graduate and undergraduate student volunteers, all of whom are invested in promoting evolution education. In 2016, we hosted a weeklong series of events focused on a central theme of paleontology, involving a lecture series, birthday party, Teachers workshop, art contests, and more. Our keynote lecture, at the culmination of the weeklong event, was given by Dr. Neil Shubin, paleontologist and author of popular science book Your Inner Fish, was attended by over 600 university and community members. Celebrating Darwin’s theory of evolution by natural selection is particularly important in the United States, where a nearly one-third of the adult population does not accept the evidence for evolution (Miller et al. 2006). The United States has one of the highest percentages of adults who do not accept evolution, compared with 33 developed nations (Miller et al. 2006). Misconceptions have led to a number of proposed laws to undermine the teaching of evolution. Several states (e.g., Tennessee, Louisiana, Mississippi, and Kansas; Matzke 2016) have passed what are referred to as ‘stealth creationist’ legislation that promotes teaching alternative concepts, such as Intelligent Design, alongside evolution (Scott and Matzke 2007; Matzke 2016) or promotes teaching nonscientific ‘holes’ in well-established scientific principles. Tennessee in particular, the state in which the famous Scopes Trial took place nearly a century ago, has recently passed laws that allow for the teaching of nonscientific concepts in public school classrooms. It is important that this misinformation is met with thoughtful conversation and rationale, which is one of the overarching goals of the Darwin Day UT program. As evolutionary theory is not just contentious with the public in the southern United States, but across the globe (Miller et al. 2006), it is important for scientists to reach out and engage the community to help them understand science. Darwin Day is a highly effective method to reach out to the community; our goal herein is to provide a detailed account of our 2016 programs in the hope that others will be able to utilize our ideas in starting or continuing their own Darwin Day celebrations. Dr. Massimo Pigliucci, former assistant professor in The University of Tennessee’s Department of Ecology and Evolutionary Biology (EEB), founded Darwin Day UT in 1997. Since then, the celebration has been organized and executed by graduate and undergraduate students within numerous science departments across the university. The event first started with an information booth, a film series shown at the library, and a keynote address. Since then, the event has grown larger each year; for the past few years, Darwin Day UT has become a week-long event that has involved multiple speakers, a multi-day information booth, a teachers workshop, an all-ages birthday party for Darwin, and more, all largely focused on a central theme (refer to Table 1 and Goodman (2008) for earlier Darwin Day UT events). On the origin of birds: did the age of the dinosaurs ever end? The banning of teaching evolution in public school classrooms is considered to be one of the first steps in the anti-evolution movement (Moran 2002; Matzke 2010). This movement gained speed in the early 1920s when William Jennings Bryan began a nationwide cause to ban the teaching of evolutionary principles in high school classrooms. He succeeded in many states, including Tennessee. A teacher, John Scopes, from Dayton, Tennessee volunteered to act as the defendant in what would later be called the “Scopes Monkey Trial” of 1925 (Matzke 2010). For nearly four decades after the event, the law remained in place prohibiting the teaching of evolution (Goodman 2008; Matzke 2010). Even after the ban was lifted, however, significant mistrust of evolutionary theory held in residents of Tennessee and still exists today. In 2012, legislation (e.g., HB 368/SB 893) was enacted in Tennessee that allows alternative concepts, none of which are based in testable science, to be taught alongside scientific theories, such as evolution and climate change, in public school classrooms. This law also allows for educators to present what they consider to be weaknesses in these scientific theories, regardless of whether or not these weaknesses are rooted in valid scientific thought, in order to bolster alternative unscientific concepts. Similar bills across the United States have been ruled as unconstitutional (Wexler 1997; Pennock 2003). Bills such as these will only foster misunderstandings of scientific principles, especially within the field of evolutionary biology; the Darwin Day organization works to combat these misunderstandings. It is irresponsible to purposefully mislead students on well-supported scientific theories and undermine their understanding of the scientific method, the foundation upon which all branches of science heavily rely (Scott and Branch 2003). A scientifically literate public, especially in evolutionary science is essential for maintaining and supporting the growth of scientific discovery in this country, especially in medical, agricultural, and sustainability research (Goodman 2008). For the past several years Darwin Day UT has incorporated an annual theme around which to focus our seminar series; for 2016, the theme was paleontology. In order to promote an inclusive environment, all of our events (Table 2) were free and open to university faculty, staff, and students, as well as the Knoxville community. To further promote interaction with community members, Darwin Day UT sponsored a wide variety of different events, held at different times of the day. Our events were advertised widely via social media (e.g., Twitter, Facebook, Instagram), our website (http://www.darwindaytn.org), newspaper ads, newspaper articles, televised news excerpts, flyers posted in university classrooms and in popular buildings within the city, and more. Friday, February 5th, 2016: Downtown Knoxville, 5–7 p.m.
Tuesday, February 9th, 2016: UT campus, 10 a.m.–3 p.m.
Tuesday, February 9th, 2016: UT campus, 7–8 p.m.
Wednesday, February 10th, 2016: UT campus, 10 a.m.–3 p.m.
Wednesday, February 10th, 2016: UT campus, 11:30 a.m.–12:30 p.m.
Wednesday, February 10th, 2016: UT campus, 7–8 p.m.
Thursday, February 11th, 2016: UT campus, 10 a.m.–3 p.m.
Thursday, February 11th, 2016: UT campus, 11:30 a.m.–12:30 p.m.
Thursday, February 11th, 2016: UT campus, 7 p.m.–9 p.m.
Friday, February 12th, 2016: UT Campus, McClung Museum of Natural History, 4–6 p.m.
Saturday, February 13th, 2016: UT Campus, 9 a.m.–2 p.m.
Our theme of paleontology was chosen to combat the specific misconceptions of evolution that exist in the context of deep time. Commonly made arguments that there are no transitional fossils and that there are no examples of macroevolution (see Mead 2009 for a thorough discussion of common misconceptions of evolution and the fossil record) show a significant misunderstanding of evolution in geologic time. Paleontology is an exciting subject that is relevant in many aspects of popular culture; the goal of this theme was to bring in interested members of the community and help to dispel these misconceptions of evolution and paleontology, while introducing them to fascinating research within this particular field. Each year, Darwin Day UT sets up an information booth along a highly populated stretch of campus with advertising for our events, merchandise, free informational handouts, recent academic publications on the importance of teaching evolutionary science in schools. The booth, set up for multiple days, is staffed with several volunteers (refer to Table 2 for a list of volunteer duties and number of volunteers needed for specific events) to answer questions. These volunteers, comprising undergraduate and graduate students, are trained to respond to all inquiries with calm, nonjudgmental approaches; they receive information on common misconceptions of evolution, ways to explain evolutionary theory to people unfamiliar with scientific concepts, and on common religious concerns involving science. Volunteers were also given examples of real experiences faced by previous volunteers at Darwin Day UT (e.g., university students telling volunteers that evolution is a religion, or that religion and evolution are incompatible) with guidelines on how they were handled. In this instance, volunteers would explain that evolution is rooted in the scientific theory and rigorous hypothesis testing; observations can be made about evolution in the lab and in the field. Volunteers also would explain that religion and science answer fundamentally different questions using different methods; therefore, there is no reason that they need to be incompatible. These questions and comments from university students have often led to respectful discussions of the common misconceptions of the evolutionary theory. Protestors from a religious organization came to speak against evolution across the walkway from the information booth; the organization, comprising three-four members on average, did not approach the information booth. Volunteers used their presence as an opportunity to further stress to questioning students that science and religion are fundamentally different, and that many misconceptions of evolution are rooted within the misunderstanding that evolution is a belief system. 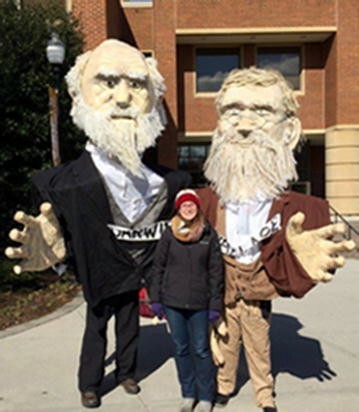 In order to attract more community engagement, Darwin Day UT also uses larger than life puppets of Charles Darwin and Alfred Russel Wallace (Fig. 1), created by local artists in 2013. The puppet of Alfred Russel Wallace is especially important for this event, as volunteers also try to teach the history of evolutionary theory. While the theory of evolution via natural selection is often attributed to Charles Darwin, many members of the public do not know that he coauthored the first published report with Alfred Russel Wallace, who developed his theory independently of Darwin. The puppet of Wallace, therefore, serves as a useful teaching tool to educate people in how the evolutionary theory was actually developed. The puppets, worn by university students, are used for major events in downtown Knoxville as well at our information booth on campus. The large characterized puppets provide an easy and fun icebreaker to discuss our purpose for hosting Darwin Day UT, upcoming events, and answer any questions surrounding evolution. In 2016, Darwin Day UT hosted three evening lectures and two lunchtime talks, culminating with the keynote seminar on the last evening of the annual celebration. Our goal in choosing speakers for our lectures was to highlight some of the outstanding paleontological research that is currently happening in Tennessee right now, as well as to showcase a variety of paleontological topics that would interest a wide range of people, from university students to community members. Lecture topics ranged from paleoanthropology, biomechanics of early terrestrial vertebrates, crocodylian paleontology, recent fossil site discovery in Tennessee, and the expeditions to find famous transitional fossil Tiktaalik roseae. These lectures served to show how inextricably rooted paleontology is within evolutionary science, and to address the most common misconceptions of evolution that occurs within the scope of geological time. Our intention was to draw a large crowd for 2016’s keynote event by bringing in a well-known speaker, Dr. Neil Shubin, bestselling author and star of the PBS series Your Inner Fish. To achieve this goal, we successfully applied to multiple small grant agencies within and outside of The University of Tennessee, Knoxville (these agencies are listed in the acknowledgements). During his keynote lecture, he took our audience through his relentless journey to find the geological outcrops that he rightfully suspected would supply one of the greatest transitional fossils ever discovered, Tiktaalik roseae, a fossil that lead to a greater understanding of tetrapod transition from water to land (Daeschler et al. 2006). The evening keynote lecture was attended by over 600 people from the eastern Tennessee community, including: numerous K-12 school students, local teachers, community members, and even a few protesters. Together with the McClung Museum of Natural History and Culture in Knoxville, TN, we hosted a birthday party in honor of Charles Darwin. As a large aspect of Darwin Day is to promote community involvement, the museum is an excellent venue to excite students of all ages. The museum provided guided tours through the museum exhibitions, which the geology and paleontology of Tennessee, as well as hosted science-themed party games (e.g., pin the tooth on the T. rex and science scavenger hunts utilizing information from museum displays) and a birthday cake for Charles Darwin. The birthday party was attended primarily by interested community members that were not affiliated with the university (preschool and elementary age children, from homeschool, private, and public school backgrounds, along with a number of adults from within the Knoxville community). Darwin Day annually hosts a teachers workshop, aimed at encouraging local educators to combat misinformation surrounding the teaching of evolution here in Tennessee. At the end of the fall semester, we mailed out upwards of 200 letters to schools in Knox County and six of the immediate surrounding counties, with information pertaining to our free teachers workshop as well as grade level contests for students to participate (see contest section below). The teachers workshop was a 5-h event on a Saturday, for which they were able to receive professional development credit. Fifteen teachers, ranging from K-12, from both public and private schools, participated in the workshop. We started with an icebreaker to discuss common difficulties that teachers had previously encountered with student comments or confusion surrounding evolutionary topics. Both the teachers and workshop leaders worked to come up with solutions to common problems (e.g., students feeling that evolution was against their religious beliefs or parent opposition to teaching evolutionary science) that would work to diffuse students’ unease with the subject material and help them to understand it better, while helping the instructor remain in control of the classroom. A number of previous encounters, for example, centered on student misunderstanding of the definition of a scientific theory versus a law or hypothesis; workshop leaders and teachers discussed the importance of a deep, thorough understanding of the scientific method to help students understand how scientific theories come into existence. Teachers and leaders also discussed how to help students understand the differences between testable scientific hypotheses and untestable ideas, to further separate the distinctions between science and religion. Dr. Alycia Stigall from Ohio University was our guest speaker for the workshop. She has worked with K-12 teachers in Ohio to implement fossil based lesson plans into the classroom. She gave a detailed lecture on her collaboration with K-12 teachers and we went through several of the lesson plans she developed. Darwin Day UT also modified and generated a large number of lesson plans that focused on paleontology and evolution; after the lunch break, teachers were separated into grade level blocks (by elementary, middle, and high school) to examine and run through individual lesson plans and discuss any issues they could see arising with their class. Teachers left with access to an online folder that contained all of the lesson plans, as well as PDFs of posters, created by UT graduate students, covering information pertinent to evolution and paleontology such as: the age of the Earth, principles of fossil preservation, and how fossils are preserved within the rock record (Additional file 1). As our theme this year was paleontology, we assembled 75 fossil kits (Fig. 2) to distribute to teachers. We received a large donation of fossils from the Dry Dredgers Association based in Cincinnati, Ohio, and were able to augment this from our own surplus in the Department of Earth and Planetary Sciences at UT. These kits included 17 commonly found fossils from North America, like brachiopods, bryozoans, shark teeth, and crinoid stems. Prior to the event, we spent a significant amount of time modifying lesson plans that were well suited to our workshop. This included adding relevant Tennessee State Standards to the start of each lesson and in some cases, tailoring lesson plans (Additional file 1) to fit specifically with our fossil kits. A group of student volunteers met for a few hours during the weeks leading up to the event and, in groups of two, modified lesson plans as a group to achieve this goal. Fossil kits that were not distributed during the workshop were given to our sponsor, The National Institute for Mathematical and Biological Synthesis (NIMBioS), and kept as a set in our department to use when traveling to local schools and homeschool groups. To gain community and young student participation, Darwin Day UT annually hosts contests for elementary, middle, and high school students, open to all public and private school students across surrounding counties. The objective of these contests is to involve young students in evolutionary science and help in developing their curiosity and creativity. 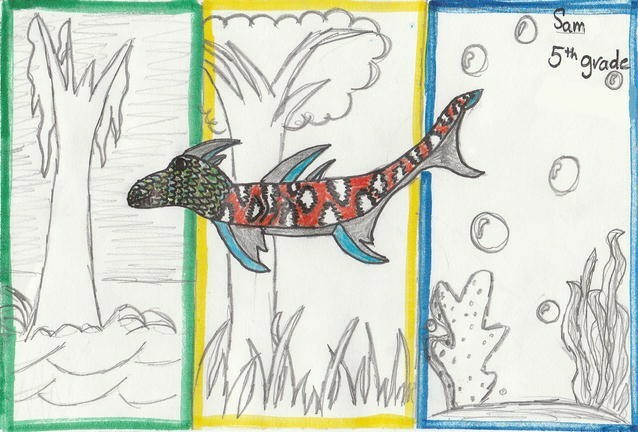 This past year, elementary school students created a common ancestor of a tiger, an alligator, and a shark. Middle and high school students were tasked with creating a future descendant, from any organism of their choosing. They were to make note of the organism’s original form and be creative in the evolution of the new form. The winners’ art (Fig. 3) was displayed on the projector while the audience was being seated in the auditorium and their names were announced at the start of Dr. Neil Shubin’s lecture. The budget for Darwin Day UT fluctuates annually, depending on the types of events planned and the speaker fees. The budget typically ranges from $2500 to $13,000 and is broken into these categories: speaker fees (including lodging and travel for the speaker), university room rentals for the events, refreshments for lunchtime events, teachers workshop (for printed materials, binders, and refreshments, primarily), merchandise, and advertising. The bulk of fundraising is done through donations from the University of Tennessee, Knoxville departments; Darwin Day UT representatives mail letters to all department heads (see Additional file 2) on campus at the beginning of each academic year, asking for small sums of money (typically $50–$300). When speaking fees are low (~ $500), the annual budget can be largely sustained through these donations. In years where the budget was larger (e.g., 2016’s budget was approximately $13,000, where approximately ~ $11,000 was earmarked for the keynote lecture), we sought funding from alternate sources. We contacted local geology and paleontology clubs for small donations of both money and materials for fossil kits and we also applied for small outreach grants through various professional societies (e.g., The Paleontological Society, The Society for the Study of Evolution) and internal grants through UT Knoxville reserved for student groups (see “Acknowledgements” section). Additionally, we sold merchandise (bumper stickers, baseball caps, and t-shirts) at all of the events to raise money for the next year’s Darwin Day; merchandise, on average, brought in between $500 and $700 in profit per year. We advertised the events by contacting local radio and television stations for interviews with the Darwin Day UT coordinators. We invited local news stations to cover the events in person and the news crew interviewed some of the speakers. Darwin Day UT coordinators and speakers also spoke to the campus radio station to promote the event and explain why we felt that our message was so important to share. Further, we reached out to newspapers within the area; many newspapers wrote articles about the event beforehand, focused on the history of the event in Tennessee and upcoming events in 2016. Volunteers created quarter page ads for the campus newspapers; these ads were printed the week of the event. Flyers for the talks and birthday party were distributed heavily across the university’s campus and to numerous businesses, libraries, and public spaces across the greater Knoxville area (examples can be found in Additional file 3). Volunteers coordinated social media accounts via Facebook and Twitter to post science factoids and updates about the events on a regular basis (daily during the month of February). Social media posts were highly effective, reaching a few 100 people on average with every post. We also advertised our events for free on sites such as darwinday.org, the international Darwin Day site, the university’s events calendar, and Knoxville community pages. Students were encouraged to go to the events via their professors; Darwin Day UT representatives emailed professors of science and science writing courses with the event information and did classroom visits to promote Darwin Day UT throughout the week of the events. Our goal was to make evolutionary science accessible and enjoyable for as many students and community members as possible. We invited speakers that we had heavily researched beforehand, to ensure that the speakers that came excelled in breaking down their specific science well to general audiences. To ensure that our events were further accessible to all, we hired American Sign Language (ASL) interpreters for our evening events. We advertised all Darwin Day UT events to the Tennessee School for the Deaf and the Knoxville Center of the Deaf; while some students utilized these resources, better effort to advertise the accessibility of our events should be taken in the future (e.g., to nearby cities, etc.). The ASL interpreters were given scientific words, such as Tiktaalik and names of periods of the geologic time scale, in advance in order to better interpret unfamiliar terms to the audience. The primary difficulties that Darwin Day UT experienced during the course of the planned events were public misconceptions of the definition of science. Darwin Day UT planners received a small number of negative responses via email to advertisements from various individuals. The most common claim was the evolution was a religion, and it was inappropriate to share religious views in public platforms. We also received a moderate number of protestors at the events, namely at the birthday party (a group of 10–15 protestors), the keynote lecture (a group of three-four protestors making speeches), and the information booth (three–four of the same protestors daily). These protests, part of organized religious group(s) (it is unclear if there was more than one group represented), attempted to pass out flyers and brochures about the dangers of teaching evolution to children, the ‘holes’ in the theory, and why evolution cannot be scientifically tested. These groups did not attempt to disrupt the events or enter the buildings in which the events were taking place. Darwin Day UT coordinators invited the protesters to learn more about the events, but chose not to press further or engage them negatively. Acquiring a large volunteer base was clearly crucial for this event. Although this paper reads as though we had a large team of volunteers, it was often the same handful of approximately ten students that were called upon regularly. We formed small committees (one for advertising, merchandise, contests, and the teachers workshop) to handle each of the various tasks involved with the event and each committee had some number of volunteers associated with it. Not all student volunteers were equally dedicated to any given event; as with many events involving multiple volunteers, some were not able to fulfill their obligations without advance notice. In many cases, the heads of the committees or the co-leaders had to take on extra responsibilities, to aid in setting up tables or creating flyers, ads, or posters, in the instance that the volunteers originally performing the tasks were not able. To circumvent these issues, many professors were willing to offer small amounts of extra credit in exchange for volunteering. Volunteers were also asked to provide their contact information, which was distributed to all other volunteers, to promote accountability. Reminders were sent to the volunteers each evening. Coordinating volunteers for the multiple events was easily the most time consuming part of Darwin Day UT. Obtaining survey data and feedback from attendees has also been difficult; while voluntary surveys were handed out at a number of the events (see “Attendance and feedback” section below; Fig. 4), a very low percentage of attendees filled out the survey. Efforts to have more people fill out the survey data for the upcoming years of Darwin Day UT are underway (e.g., having student volunteers ask attendees walking in the door and recording the information digitally, instead of voluntary paper surveys). We had some anecdotal evidence of success. We had a number of students, community members, and teachers approach us after the events to discuss what they learned. A number of people communicated to us that they had not fully understood how evolution worked in the geologic time scale and that these events helped them to better understand it. University students who spoke to coordinators after the events stated that they learned more about how paleontology data is collected and how we can use it to understand evolutionary trends. Approximately 1000 people attended Darwin Day UT events in 2016, which is at least double the amount from previous years. Approximately 40–50 people (largely all students, staff, and faculty of the university) attended the lunchtime lectures. Approximately 100–150 people (university students, staff, and faculty, and interested community members) attended each of the lectures leading up to the keynote lecture. Approximately 550–600 people attended the keynote lecture by Dr. Neil Shubin; this event received the most attendance from non-university people, with many K-12 students, their parents, and teachers present. Increased attendance from previous years is likely due to increased advertising via Internet sites and social media. Surveys for demographic information were given out at each of the evening events; information such as university status (if applicable), and how each person heard about the event (Fig. 4). Space was provided for feedback, if the attendee was willing to communicate any. Unfortunately, a low percentage of attendees filled out the surveys, so this data is not representative of the 2016 Darwin Day UT attendance. We hope that providing a detailed account of our most successful Darwin Day UT celebration in 19 years that it will provide a framework for other institutions and organizations to start their own chapter or increase their existing presence. As public contention over scientific theories continues to play a role in the education of students of all ages, scientists must work to effectively educate the public in order to continue a strong presence in scientific research and industry in the future. A scientifically literate public is necessary to successfully face the challenges of a continually changing world, especially in fields such as medicine, agriculture, and sustainability. Darwin Day presents a fantastic opportunity to engage, excite, and explore science and evolutionary biology across the world. Authors contributed equally to writing the final manuscript. Both authors read and approved the final manuscript. A warm thank you to the Darwin Day advisor, Dr. Brian O’Meara who provided support and encouragement throughout our 2016 experience. Special acknowledgment goes to Dr. Stephanie Drumheller for feedback on earlier versions of this manuscript and to the anonymous reviewers who improved this manuscript tremendously. The Department of Ecology and Evolutionary Biology at UT has provided funding, storage space, and support for Darwin Day UT since its emergence in 1997. Darwin Day UT would not be possible without the help of all volunteers and funding sources over the years, including: The Society for the Study of Evolution, The Knoxville Gem and Mineral Society, the Dry Dredgers, the University of Tennessee Student Programming and Allocation Committee, the Ready for the World Foundation, The McClung Museum of Natural History, the University of Tennessee College of Arts and Sciences, College of Agricultural Sciences, Departments of: Earth and Planetary Sciences, Psychology, Religious Studies, Theater, Biosystems Engineering and Soil Science, and Entomology. We would also like to thank Kevin and Cindy Collins, the artists behind the larger than life puppets of Charles Darwin and Alfred Russel Wallace. Publishing fees were generously provided from the Open Publishing Support Fund, co-sponsored by the Office of Research and Engagement and the University Libraries. The materials used for the teachers workshop, advertising, and funding from Darwin Day UT 2016 Additional files 1, 2, 3 are available in the open access Zenodo repository, https://doi.org/10.5281/zenodo.159488. For other lesson plans and handouts not used during the workshop, but were still modified for potential use, these materials are available at: https://github.com/jenebauer/Fossils_in_the_Classroom. 12052_2017_73_MOESM1_ESM.zip Additional file 1. Teaching materials and lesson plans used during the teachers workshop hosted through Darwin Day UT. 12052_2017_73_MOESM2_ESM.pdf Additional file 2. Sample letter sent to various departments on UT campus to request funding for Darwin Day events. 12052_2017_73_MOESM3_ESM.zip Additional file 3. Sample flyers created for Darwin Day UT events.